After first-round exit last year, he tops Australian Bernard Tomic in straight sets. 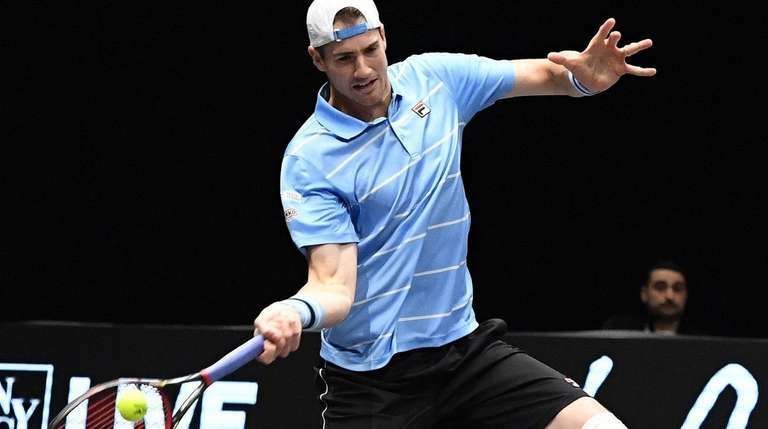 John Isner finally got his first victory of 2019 on Wednesday night, six weeks into the season. The New York Open’s No. 1 seed defeated Australian Bernard Tomic 7-6 (7), 6-4 in a first-round match at NYCB Live’s Nassau Coliseum. It took him five match points in the 10th game of the second set, but now he’s on to the second round where he will face another Aussie, Jordan Thompson. 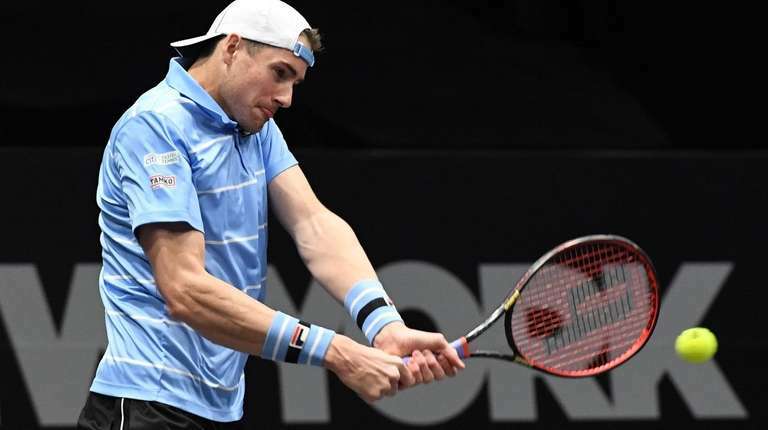 Isner was well rested at the start of the 2019 season to be sure, having been dumped out of the Australian Open in the first round by fellow American Reilly Opelka in four tiebreak sets. That was after being beaten in his first match in Auckland, New Zealand by American Taylor Fritz. He hadn’t won any match since Paris last October. John Isner returns to Bernard Tomic during the second round of the NY Open ATP World Tour Tennis Tournament at NYCB Live's Nassau Coliseum on Wednesday, Feb. 13, 2019. Neither player gained any traction on the other’s serve in the first set. No one had to defend a break point and the set went to a tiebreak. Isner held the first set point at 6-5, but Tomic nailed a forehand winner. Tomic held one at 7-6, but Isner nailed an ace, one of six he served in the tiebreak. On the deciding 15th point Isner muscled back a big serve and Tomic hit the return wide to give Isner the set. The 2018 season was a good one for Isner after an equally poor start that included losing in the first round of the New York Open to Radu Albot. Isner won the top-tier event at Miami over Alexander Zverev in March, lost in the Wimbledon semifinals to Kevin Anderson, 26-24, in the fifth set in July, won the Atlanta tournament in July and lost in the U.S. Open quarterfinals in September. Packing away big points, he ascended to No. 9 in the world. But Isner’s big serve was again his biggest weapon, delivering 27 aces out of the 73 points he won. Notes & quotes. Albot seems adept at taking down really big players. After toppling Isner, who’s 6-10, last year, he defeated 6-11 Ivo Karlovic on Wednesday in the second edition of the Open. Albot is all of 5-9 and from the tiny country of Moldova. The diminutive Albot found a way to eke out a 6-7 (4), 7-6 (4), 7-6 (5) win over Karlovic in a first-round match. Karlovic never lost his serve, never faced a break point and won 120 total points to Albot’s 114. Karlovic served 37 aces and got in 81 percent of his first serves, numbers that would have seemed overwhelming. But the key for Albot was holding his own serve. He saved both break points he faced and served 77 per cent . . . Veteran Paolo Lorenzi, the 37-year-old Italian coming off a down season with a broken foot, won his second-round match over American Ryan Harrison, 4-6, 6-4, 6-4 . . . Two young Americans were eliminated when Denis Istomin defeated Mackenzie McDonald, 4-6, 6-2, 6-3, and Jordan Thompson beat Christopher Eubanks, 4-6, 6-1, 6-4.